This small, friendly country is perfect if you want to get away from it all - whether your preferences are a bit of luxury or to take to the hills on horseback! Uruguay’s sophisticated capital Montevideo, on the banks of the River Plate, has fine dining, an eclectic night life and a chic shopping district noted for its art deco architecture. Just down the coast are the fashionable resorts of Punta del Este or José Ignacio - the place for the glamorous set to see and be seen. But with miles of deserted, pristine beaches, you can easily seek out sun and solitude, hone your surfing skills or enjoy some fantastic bird watching. Riders are in for a treat too - galloping through the salt spray or exploring the expansive, rolling countryside inland. Away from the main tourist destinations, highlights include wine tasting at romantic vineyards and strolling through the cobbled streets of charming colonial towns. Stay in a historic estancia and discover gaucho culture on a working cattle ranch - locals say the beef is the best in the world. Try it in a juicy chivito sandwich followed by a dulce de leche with a flask of yerba mate - a high-caffeine herbal infusion as ubiquitous as the great British cuppa. 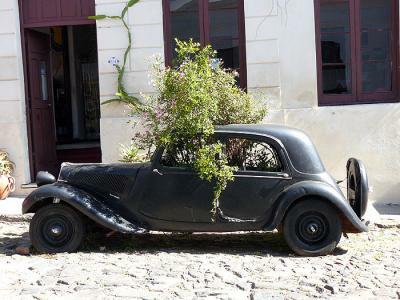 Peaceful Colonia del Sacramento has the best-preserved colonial architecture in eastern South America. Just a short trip across the river plate from Buenos Aires make it near enough for a day trip, but the town warrants a few days in its own right to appreciate its charm. 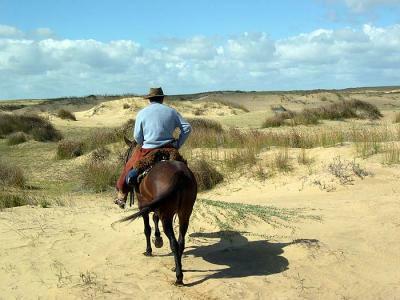 The 340km coastline from Montevideo to the Brazilian border is awash with beaches, dunes, forests and lagoons. 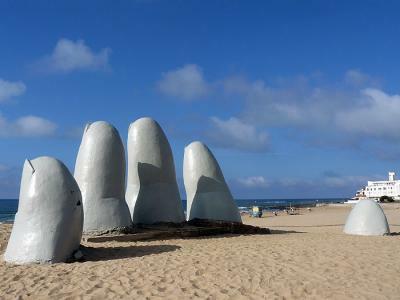 Lively Punta del Este and the quiet fishing villages beyond are the places to see and be seen from December to March. Uruguay has a gentle climate, with mean temperatures ranging from 25ºC in the summer, to 12ºC in the winter. Rainfall is fairly evenly distributed throughout the year (though July and August can be wetter). The high season in Punta del Este is their summer, December to March. Typhoid, tetanus and polio advisable, no vaccinations are mandatory. Not required for most nationalities for 3 month stays, except Australians and Canadians. The local currency is the Peso Uruguayo. Banks and exchange houses will change cash and travellers cheques (which should be in US Dollar denominations rather than Sterling). Some hotels will also change money, though not at such good rates. MasterCard and Visa are widely accepted and American Express in some places, but do check for additional charges. It is increasingly possible to obtain money with ATM machines. The telephone system is operated by Antel. There is direct dialling from public phones to the UK, but they cannot receive incoming calls. Tip: If you have a BT Chargecard then take it. You can dial 0004 44 (free) from some telephones and will be connected straight to the BT operator in the UK. The language is Spanish, but English is widely spoken.